An original letter of correspondence between Joshua Coffin Chase and golf course engineer and landscaper William Langford. Topics discussed in the letter include Langford mapping a golf course for the Sanford Country Club and Golf Course. The Sanford Country Club and Golf Course, which is now named the Mayfair Country Club, was originally purchased as a portion of a 20,000-acre tract by General Joseph Finegan for $40. In 1870, Henry Shelton Sanford purchased the tract and sold some of it in 1878 to Charles Amory.In 1922, the City of Sanford bought 152-acres to design and construct a municipal 18-hole golf course. The course opened in October of 1922 with only four holes available for playing. The remainder of the golf course was opened in September of 1924. From the year 1927-1939, the golf course and country club experienced once of its most successful periods as it saw some of golfs greatest athletes, such as Gene Sarazen and Walter Hagen. However, the club, for a time, saw a state of disrepair and depression. For a short time, the club became the Seminole County Club after renovation in 1945. Then, in the late 1940s, the New York Giants received the Mayfair Inn for Spring training, which allowed them to take control of the golf course. This led to the most prosperous period of the golf course and country club becoming a part of the PGA tour between 1955 to 1957, seeing players like Arnold Palmer tee-off on the course. In 2007, Maece Taylor, Inc. signed a 20-year lease with the City of Sanford for the golf course. In 2011, Maece Taylor filed a lawsuit against Sanford, claiming that the lease is invalid due to a clause in the contract that states that Donald Ross, a critically-acclaimed designer in the 1920s and 1930s, designed the golf course. The Chase papers contain letters that suggest that Cameron Trent designed the golf course, not Ross. Original letter from Joshua Coffin Chase to William Langford, March 27, 1922: Chase Collection (MS 14), box 50, folder 20.111, Special and Area Studies Collections, George A. Smathers Libraries, University of Florida, Gainesville, Florida. 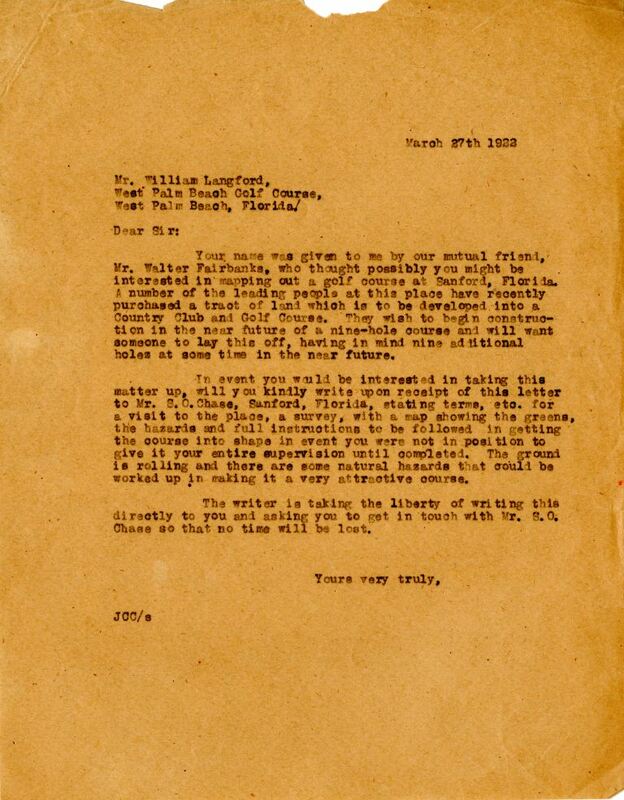 Digital reproduction of original letter from Joshua Coffin Chase to William Langford, March 27, 1922. Chase Collection (MS 14), box 50, folder 20.111, Special and Area Studies Collections, George A. Smathers Libraries, University of Florida, Gainesville, Florida. Moorhead, Richard, and Nick Wynne. Golf in Florida: 1886-1950. Charleston, SC: Arcadia Pub, 2008. Your name was given to me by our mutual friend, Mr. Walter Fairbanks, who thought possibly you might be interested in mapping out a golf course at Sanford, Florida. A number of the leading people at this place have recently purchased a tract of land which is to be developed into a Country Club and Golf Course. They wish to begin construction in the near future of a nine-hole course and will want someone to lay this off, having in mind nine additional holes at some time in the near future. In the event you would be interested in taking this matter up, will you kindly write upon receipt of this letter to Mr. S.O. Chase, Sanford, Florida, stating terms, etc. for a visit to the place, a survey, with a map showing the greens the hazards and full instructions to be followed in getting the course into shape in event you were not in position to give it your entire supervision until completed. The ground is rolling and there are some natural hazards that could be worked up in making it a very attractive course. The writer is taking the liberty of writing this directly to you and asking you to get in touch with Mr. S.O. Chase so that no time will be lost. Chase, Joshua Coffin. 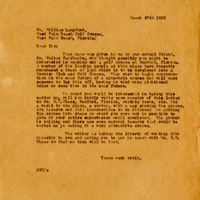 “Letter from Joshua Coffin Coffin Chase to William Langford (March 27, 1922).” RICHES of Central Florida accessed April 20, 2019, https://richesmi.cah.ucf.edu/omeka/items/show/1631.